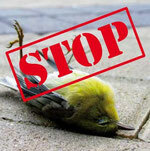 Birds covers for post insulators from weatherproof plastic avoid contact with live parts. Covers are suitable for all insulator head diameter up to 130 mm. PE material with high weather resistance and high dielectric strength. At 250 km / h tested in the wind tunnel. Optimum adaptation to the pipe run through the design and bellows. 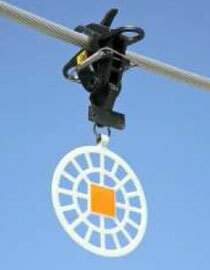 Quick mounting with captive fastening tapes. Straps are self-locking and fit through continuous adjustment of each rope diameter, and more ropes or attaching them to. Cover is aimed at tightening the straps off automatically. Fire-fly and fly Scare-fly are optically acting bird spike. They used the reflection of sunlight during the day and at night fluoriszierende lighting effects. The included film reflects the sunlight during the day. By a second film is a sparkling effect is achieved, which is recognized by birds up to 400 meters. By the reflection and the sparkling effect change their flight patterns and soft birds from the protected objects. According to a study from Cornell University, Ithaca (New York, USA) take birds perceive light in two spectra: daylight and ultraviolet light. The Fire-fly and the Scare-fly used both spectra (360nm and 560nm wavelength). Unlike the fire-fly of the Scare-fly is round. In the center of the disc has a special reflective tape is red / yellow applied. The Fire-fly should be implemented when needed and at the onset of habituation. A guarantee for the function can not be assumed. 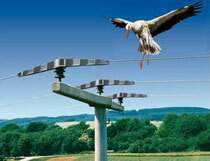 Larger birds like to sit on power lines and cause short circuits when they touch the live parts. In order to prevent short circuits and the inevitable death of the birds in the Triangle Model VT has been developed. 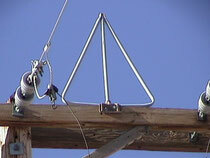 The triangle is made of hard plastic and is therefore suitable for use on power lines.